German immigrants settled in this area in the mid-1800s. Their cluster of homes became the village of Charlesburg, named after their church, St. Charles. Roepke’s traces its roots to 1880, when it was a saloon, hotel, stagecoach stop and barbershop. It also served as a church theatre, grocery store and dance hall in the following decades. During the 1940s and 50s, the supper club got its name from these gathering spaces that began to serve a set menu. They were typically opened in rural areas and were family run. By the mid-1900s, Roepke’s was also to host weddings and receptions. The Village Inn restaurant was purchased by the Roepke family in 1968. They proudly continue the tradition, serving flavorful steaks, the Friday Fish Fry and in-house favorites like Roast Duck, BBQ Ribs and Coldwater Lobster. 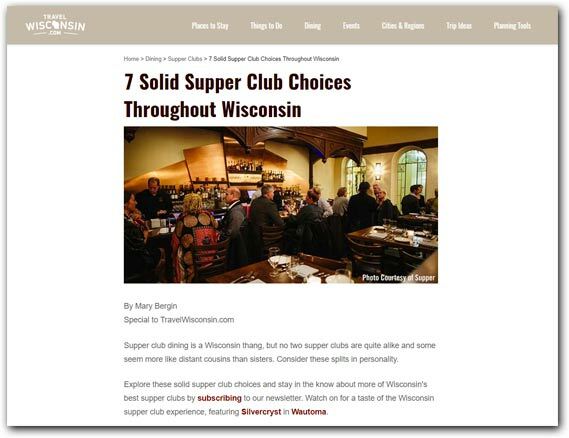 Roepke’s also added a few special touches, that make them unique among the Wisconsin supper clubs. An homage to the town’s German heritage, Roepke’s serves an authentic German Menu. This includes the popular favorite, Wiener Schnitzel, served with an egg as they do in the province of Holstein, Germany. “Wisconsin’s Holy Land got its nickname from the many hamlets that sprouted after German immigrants settled as farmers in the 19th century.